The BTS256-EF is designed for portable high accuracy illuminance and luminous color measurements in all SSL and traditional lighting application areas thanks to its compact design, high-quality light sensor and precise cosine field of view. Features nine horticultural lighting measurement standards plus self-programming of up to five different end-user spectral weighting functions. One of the key features of the BTS256-EF is its BiTec light sensor. The BTS combines a silicon photodiode with a noise-free CMOS diode array. Through bilateral correction of measurement signals from both sensors, the BiTec sensor ensures extremely accurate photometric and spectral radiometric measurement values over a wide dynamic range. The traditional light detector employing a silicon diode and a photometric correction filter still provides the best dynamic range, linearity and response time . But it cannot perform color measurements and cannot actively adjust to the target light source's spectral function. This is why the Gigahertz Optik Bi-tech sensor is also equipped with a CMOS diode array detector that works with the filtered photodiode detector. Its precise spectral match to CIE photometric V(λ) spectral curve is optimized by correction using the diode array's measured spectral data. Flicker measurement entails detection of any AC component of the light signal with a 5kHz bandwidth. The BTS26-EF measures and displays flicker frequency, percent flicker and flicker index. The meter additionally performs a Fast Fourier Transformation in order to display other frequency components in the light signal. A technical note with more on flicker measurement is available by contacting the factory. The noise component inherent in diode array light detectors has a significant effect on the signal to noise ratio (SNR) and hence on the quality of light measurement. A remote controlled shutter installed into the BiTec light sensor enables online compensation of the dark signals that are dependent on temperature and integration time. The fast photodiode in the BiTec light sensor enables the BTS256-EF to automatically synchronize itself to the test light frequency operated in PWM mode. A cosine corrected field of view is absolutely necessary for accurate illuminance measurements. For extended illuminance sources the exactness of the cosine match has significant influence on the light meter measurement uncertainty. The BTS256-EF light meter is equipped with a 20mm diffuser window for a high level cosine match. Both BiTec light sensor detectors are centrally aligned behind the diffuser window ensuring the same viewing angle. Through the cutting-edge Bi-Technology sensor concept, state-of-the-art electronics, online dark signal adjustment and the possibility to perform temperature compensation the BTS256-EF represents the next generation photometer for all light measurement applications. Fully Characterizes Any Type of Light Source for Precise Monitoring & Control in horticultural lighting in the lab, field or greenhouse. 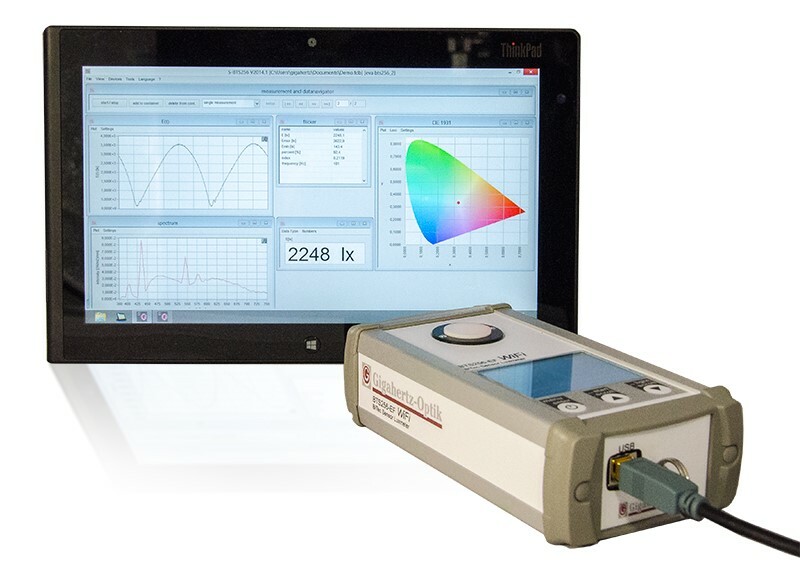 Gigahertz-Optik's BTS256-PAR Light-Color-Spectral Meter provides all necessary PAR Photosynthetically Active Radiation, illuminance (photopic & scotopic), color and spectral data to fully analyze SSL, CFL and any other type light source. Its Bi-Technology sensor improves measurement accuracy and is precisely cosine corrected. Several displays where only the most necessary and common photometric measurements are shown are available. The cursor buttons are used to switch between the displays. More experienced users can individually configure and save displays allowing any measurement quantity to be selected. An information display is available that shows all relevant measurement and set-up parameters. Three control buttons with well-structured menu navigation make for easy and safe operation. In the standard measurement mode for example, no user selection is required - all common measurement quantities are displayed. 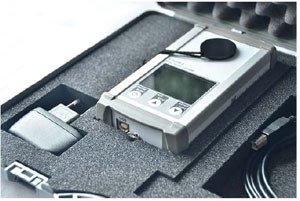 In the expert mode the user has access to all measurement parameters. Illuminance distribution map can be created using a PC and single measurement points stored in the meter. The measurement points can be progressively processed and saved. The BTS256-EF is equipped with all the functions necessary for computer-independent use. The rechargeable batteries provide eight hours of operation. The USB adapter cable can be used to recharge the battery even without a PC. A USB2 interface is provided for use with a PC enabling data exchange and battery recharging. WiFi interface is also available – see BTS256-EF WiFi. Supplied S-BTS256-E software offers all the functions necessary for measurement, display of readings and data transfer. The flexible desktop software concept enables the user to select which measurement value windows to display on the desktop. This can either be just a full screen display of lux measurement values or a matrix containing numerical and graphical display fields. Each desktop configuration can be saved for later use. For self-programmers the S-SDK-BTS256-E Software Development Tool option is available. The SDK is compatible with Lab View from National Instruments, NET from Microsoft and C/C++. The SDKs simplify incorporation of the BTS256-E series meters into user based systems. The BTS256-EF Light-Color-Spectral-Flicker Meter with WiFi comes with a powerful WiFi interface enables long distance wireless remote control of the light meter. What separates the BTS256-EF WiFi from the basic BTS256-E is its added ability to perform flicker measurements plus a WiFi interface enabling long distance wireless remote control of the light meter. Who is the BTS256-EF Light-Color-Spectral-Flicker Meter Designed For? 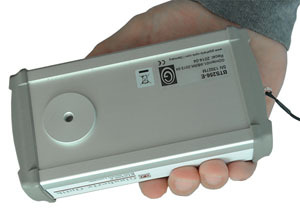 For lighting manufacturers, architectural, display, transportation, entertainment and other lighting designers and engineers, field service personnel, health and safety officers requiring all of the features and functions of the BTS256-E plus the ability to detect and quantify flicker components. For product specifications and configurable options for the BTS256-EF, please visit the Gigahertz-Optik main website here. To Order The BTS256-EF LED-Luxmeter, Call Us Today At 1-978-462-1818. You are a lighting manufacturer that needs light measurement instrumentation capable of light and color qualification of your new Solid State Lighting (SSL). The instrument must be able to accurately analyze LED and traditional light sources for comparison purposes. Some of your fixtures are large in size so an integrating sphere would be required to measure total luminous flux. But the integrating sphere solution is out of the question due to the high costs, space requirements and maintenance involved. Anyway, since your sources are designed for area illumination, for quality control purposes, illuminance measurements are more applicable than total luminous flux measurements in lumens. Correlated Color Temperature (CCT) is most important to you. However, the meter should reliably provide absolute as well as other color parameters and spectral data. competitively priced since multiple units will be required by field service personnel or possible use by technical sales department. For complete color, spectral and absolute analysis of SSL and any other light source the BTS256-E LED Luxmeter is the right tool. Interested in discussing your LED measurement application? Give us a call! 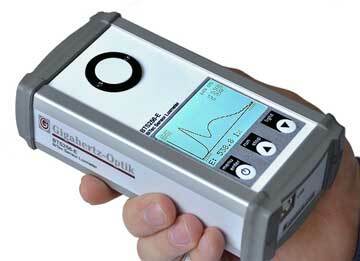 More Gigahertz-Optik light measurement instrumentation can be found on www.light-measurement.com.